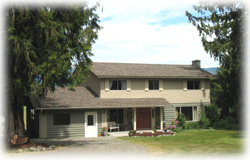 Our vacation home is in a secluded, private area on Vancouver Island in the Cowichan Region. Relax in this large and spacious four bedroom home on two private wooded acres with panoramic views and clean fresh air. Ideal for couples, a family vacation, romantic getaway or retreat for writers or artists. 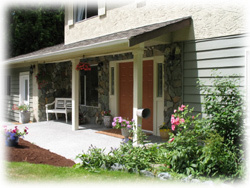 Centrally located for vacationing, between Victoria and Nanaimo. Tucked away but only minutes from all amenities, enjoy visiting wineries, beautiful ocean bays, golf, shopping and artisans, fishing, culinary experiences, kayaking, diving, birding and hiking. Spectacular views of sloping pastoral valley fields framed and set off in the background by Saltspring Island. There are 2 acres of lawn and wooded area. The large trees on and around the property provide lots of privacy. Walking is safe and out your front door is a country lane. Click here for more information on our Vacation Home.